That’s the hope of French luxury crystal glassmaker Baccarat, which recently began sales of its new line of glasses in Hong Kong, where wine imports have remained strong on the back of strong demand from mainland Chinese buyers even amid global economic uncertainty. “People tend to confuse good wine with alcohol in wine, which is not what we want,” said Bruno Quenioux, technical adviser of the Chateau Baccarat collection of professional wine glasses, which went on sale in France earlier this year. 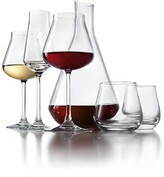 The glass has a broad base that evokes the tastevin, a saucer-like cup used by winemakers and sommeliers to taste wines, sloping sides and an unusually narrow lip at the end of a vertical “chimney” that the company says prevents the alcohol from overpowering other aromas since it sinks down when the glass is swirled prior to tasting.